Katherine McNamara, Will Tudor and Dominic Sherwood in Shadowhunters. It's no big surprise after last week's episode that the reignited passion between Clary (Katherine McNamara) and Jace (Dominic Sherwood) is a huge part of Monday's episode of Freeform's Shadowhunters. As you know, Clary was forced to kiss her former love, Jace (who she had to turn her heart off to because they were under the false impression that they were siblings! ), in front of her current love, Simon (Alberto Rosende) and, well, come on, it was a damn good kiss! But, like all things in this world, the kiss will have huge repercussions. 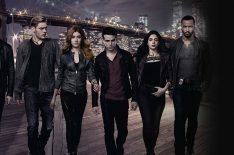 'Shadowhunters': Are Magnus' Tears a Sign of Danger for Malec? Just how much should we be worried about our favorite pair of lovers on the Freeform hit? To get a window into what we'll see in this week's rollercoaster of an episode, Sherwood spoke to TV Insider about what that kiss means moving forward, about the connection between Valentine and Jace as well as when we're going to find out more about Sebastian (Will Tudor). Going back to last week first, break down shooting that kiss between Clary and Jace in front of Simon. It was so tough to watch! It was brutal! When you’re on set you don’t really realize how bad it is until it’s all kind of cut together and it was heartbreaking when we saw it. But obviously Jace wasn’t paying as much attention to Simon and his emotions. It kind of encapsulated Jace’s emotions but then when you watch it, poor Simon. It was so heartbreaking. Tell me about Jace’s standpoint when he gets that kiss. Did this kind of open things up for him for Clary? The thing with Jace is his feelings never really changed and for a long time he was fighting them because it was incorrect—they were brother and sister, he shouldn’t be having those feelings—so he was fighting them for the longest time. But they weren’t brother and sister so those feelings were all kind of justified in his head, but she was in a relationship with Simon so that’s, again, not correct. I think in that moment it was just a lot of passion, they both just fell into each other and it felt correct and nothing else in the world mattered. It was just the two of them and they forgot where they were and who they were. Jace has been pretty respectful of Climon. Is that going to be tougher for him moving forward? Definitely! They have both discovered those feelings again and it was very open and very passionate between them even in just that one moment it was everything that they both felt. In that moment, everything is kind of released. Jace does want to be respectful but at the same time, love is love and there’s very little that can get in the way of that. 'Once Upon a Time' and 'Doctor Who' are among the latest to be added to the Comic-Con lineup. We know Alec has risen in power with the Shadowhunters and Jace seems really supportive, but is there any jealousy or resentment to that at all? No, 100% Jace is supportive. That speech Jace gave at the end of the last episode when he said, “I’ll always be a soldier. You’re the leader. You’re the person I look up to and the person that I trust and should be running this institute because that’s who you are. You’re Alec Lightwood, you are the leader, I’m Jace Herondale, I am the soldier.” I don’t see any resentment there at all. I’ve never felt it through Jace. It’s just that Alec is the right person for that job. In this week's episode, Valentine and Jace have a great scene, but Valentine knows just how to get into Jace’s head and I’m curious how tough is it for Jace to be around him? Without giving too much away, Jace and Valentine’s relationship isn’t over. This season is an amalgamation of everything that Jace and Valentine have been through for a season and a half and, by extension, the ten years that they grew up together. Valentine has a very heavy part of who Jace is because he taught him a lot of the behavior he exhibits day to day and a lot of the behavior that he tries to fight and his animosity and his aggression, he got a lot of that from Valentine. We’re not done with this relationship. Todd [Slavkin] and Darren [Swimmer, the showrunners] and I spoke quite heavily about how this will come to a crux and exactly how that relationship will come to fruition. We were very careful to make sure that it was exactly how it should be and it’s pretty cool. I’m actually very excited for people to see it. Once we found out that Valentine wasn’t truly his father, I’m glad that they kept the relationship a part of the show because those scenes between you and Alan [Van Sprang] are really great. Alan is just an amazing actor and it’s a real pleasure to work with him. I feel from my point of view a real sense of honesty through the performances when I’m working with him because that’s what it is, there is no pretense, there is no ‘how does my hair look?’ None of that exists when Alan and I are working together. It’s just about the emotions in that moment. There are a lot of questions about Sebastian. How much will he get to know about him in this next episode? In the next episode we’ll get to know a little bit but over the course of the rest of the second half of season two we’ll do a real discovery into who Sebastian is, where he came from and his relationship in the Shadow world that already exist and the relationships that are going to start being explored and re-explored. By the time we reach episode 20, we really do discover the truth behind Sebastian and I’ve got to give all credit to Will. We used to work together for a couple years in London way back when and Will is just phenomenal. He does the most amazing job. I’m pretty excited to see where that goes. He’s a wonderful addition to the team.